Bruno seems to be doing very well. His hair is growing back and he's very happy as usual. I keep checking him for lumps. So far, so good. He does have lumps at the ends of the incision points where the other tumors were removed, but I am told this is normal and will go away in time. Bruno is able to join us for walks. He loves walking with his doggie friends. 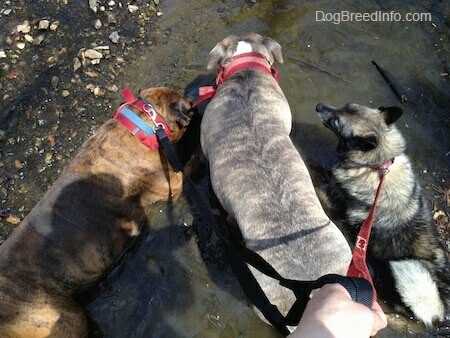 On this particular walk it was one of the warmer days and Bruno, Spencer the Pit Bull and Tia the Norwegian Elkhound cooled off in the stream. After the walks Spencer usually gets to have play sessions with the other dogs. I have not let Bruno off the leash to play yet. I am afraid his knees may not be able to handle the rough twists and turns. 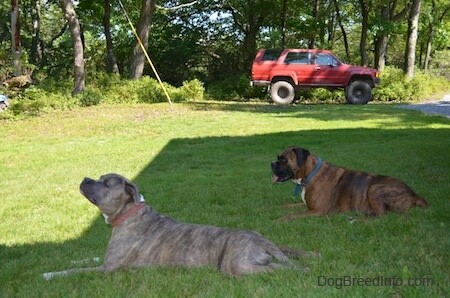 This is Bruno, Spencer the Pit Bull and Junior the Yorktese after a long walk. 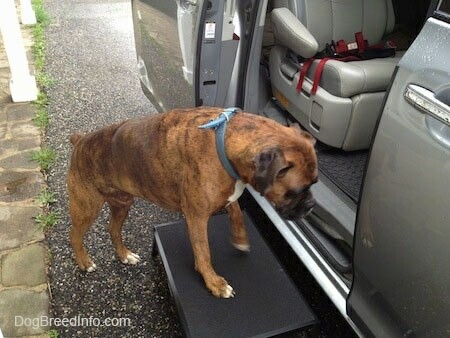 Bruno has been using a ramp to get into the back of the minivan. 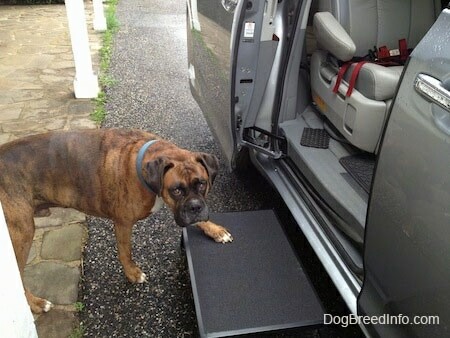 If Bruno goes in the side door it's just a little jump into the van. I tried for a little while to have him jump in the side of the van instead of having to get out the big ramp every time he got in or out. But then I noticed that he would hesitate. He didn't want to make the small jump. He started to look a bit sore. It could have been my imagination, but I don't think so. The small jump seemed to be bothering him. I decided to get him a short, wide step. It seemed quicker and easier than setting up the ramp. The step folds up quickly and has an abrasive top for good traction. 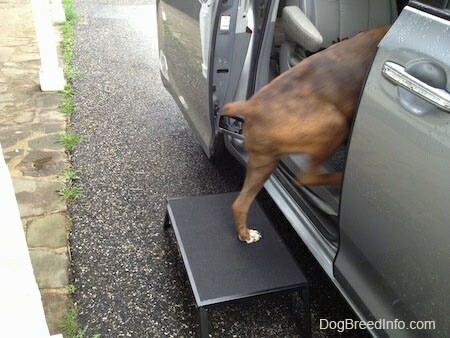 Bruno tries out the step. He likes it! Bruno had an oncology check-up and unfortunately they found a lump on his left temple. 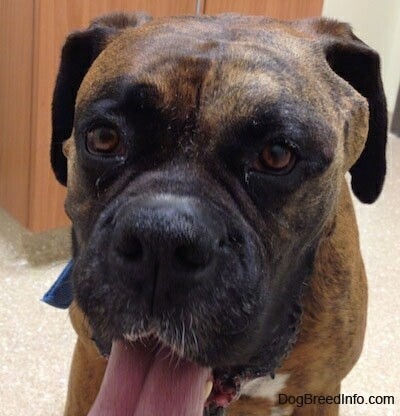 It was aspirated and confirmed to be a mast cell tumor. When a tumor is aspirated it means they put a needle into the lump and pull out cells to be tested. The fluid that was extracted has been sent away for more testing. When a mast cell tumor is agitated it quickly grows and Bruno's lump is larger in this picture than it was before his check-up. I remember asking the first oncologist (the one we no longer see) about this same temple area. I had felt a small lump. At the time I was told it was just scar tissue. The doctor at the time had not bothered to aspirate it. I am very happy with this new group of cancer doctors. 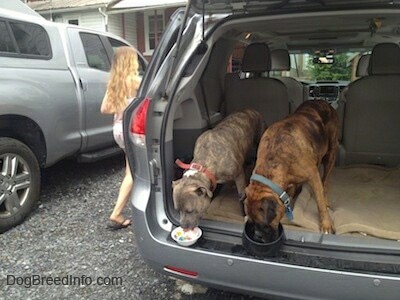 They seem much more in tune with the dogs and the best treatment for them. Bruno was overly happy at the vet as usual, trying to lick every face he saw and wagging his entire back end. He thinks these appointments are just fun and games. Now that Bruno is home I can smell him passing some awful gas. Since the tumor has been agitated it releases an excess amount of histamine, which causes gas, among other things. The vet had given him some Benadryl. I think I will give him a little more. He is obviously having some histamine issues at the moment. Oh boy, Bruno. You are making people want to clear the house! Bruno has an appointment to have the tumor removed. When Spencer the Pit Bull first saw Bruno after his appointment, his nose went straight to Bruno's temple and he gave it a good, long smell session. The vets had checked Bruno all over, touching all areas of his body looking for lumps. They rubbed his belly and pet him all over. Their scent was all over Bruno, yet Spencer went directly to his temple and smelled it for a long time. Mast cell tumors can grow very fast. It had been agitated and had grown 5 times the size in a matter of minutes after being aspirated. I have heard that dogs can smell cancer and I know Spencer smelled something on him. If I could only train him to tell me where any tumors grow! Diagnosis: New suspect mast cell tumor left temple. Today on physical exam Bruno was very bright, alert and friendly. GI/Abdominal Palpation: Abdominal palpation is normal. Lymph nodes/Thyroid gland: The external lymph nodes all palpate normally. There are no abnormal structures associated with the thyroid gland. Mouth/Teeth/Gums: The oral examination is normal. There is mild evidence of tartar on the teeth. Musculoskeletal: The muscles are in good condition. The skeleton is observed to be normal with no lameness noted. Nervous System: The nervous system is normal. Body Condition: Body condition and weight are normal. Ears: Both the ear canal and pinna are normal. Bruno seems to hear fine. Eyes: The eye(s) are normal. The eyeballs, eyelids and associated structures appear normal. Bruno appears to have normal vision. Nose/Throat: The nose and throat are normal. Air flows freely through nostrils, no discharge is noted and there are no difficulties with vocalizing or swallowing. Urinary/Reproductive: The urogenital system is normal. The urinary system is functioning normally. Skin/haircoat: A small SQ mass is noted on the left side of the head measuring ~1cm before FNA but 2cm after. Diagnostic tests: Fine needle aspiration of mass on head sent for testing. Preliminary review suggestive of mast cell tumor. Medications: Please continue Benadryl and joint support as previously prescribed. Recheck: I would like Bruno to have a recheck appointment with our surgery department regarding the mass on the side of his head. It appears that Bruno has another mast cell tumor on him. 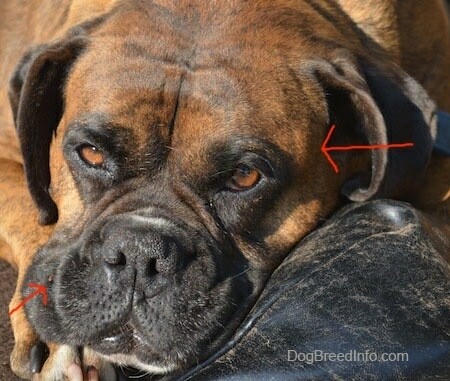 Some Boxers are prone to having multiple mast cell tumors during their life and they are all independent of one another. With each tumor, surgical removal is recommended followed by additional therapy IF indicated based on grade and margins. 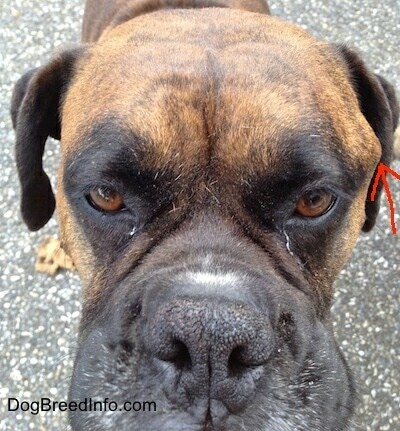 Bruno had the mast cell tumor on his left temple removed. This was not a new tumor. It was something I had felt on him for a very long time, but the prior oncologist had dismissed it as some type of scar tissue. His new doctors recognized it as a tumor and did the proper testing and removal. A lesson learned for me, to insist on testing of any odd lumps. The surgeon decided to remove the wart on the side of Bruno's face and have it tested. The prior vet had ruled it out as a cyst. We decided to play it safe. 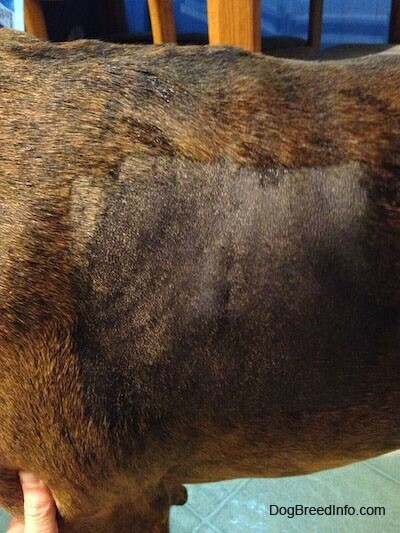 There was also a questionable area where his last mast cell removal sutures were. It felt like a knot. The surgeon shaved the area to get a better look and luckily it was only scar tissue. I had prepared myself for a Frankenstein looking face on Bruno. However, to my pleasant surprise he really does not look all that disfigured. The surgeon did an excellent job. When Bruno's hair grows back you may not even notice he had the tumor removed. One concern: the nerve that controls the blink in his lower eyelid had to be removed with the tumor. It was not possible to remove all of the cancer and leave the nerve. The surgeon believes the blink in his upper eyelid will compensate for the loss of the bottom. 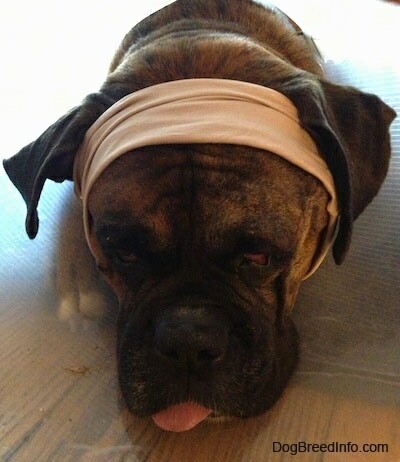 This is Bruno the day before the surgery. On the left of the picture you can see the wart on the side of his snout. On the right of the picture you can see the mast cell lump on his temple. Bruno came in for a Mast Cell Tumor Removal with biopsy and Wart Removal. We now feel that he can continue his post-operative recovery at home. Please follow the instructions below carefully for your pet's at home care and don't hesitate to call with any questions or concerns. We will contact you with the laboratory results as soon as they are received. Activity: Activity restriction will be necessary until Bruno is completely healed (usually at least 10-14 days). Confinement to an appropriately sized crate or small area with no furniture would be optimal. Activity restriction entails no running, jumping, stair climbing or playing with other animals or small children. He should only be taken outside to use the bathroom on a short leash (maximum 2-3 feet, non-retractable). Failure to confine him may result in dehiscence (opening) of the incision, and could necessitate a second surgical procedure. E-collar: Bruno should have his e-collar on for the next 14 days until the time of re-exam. 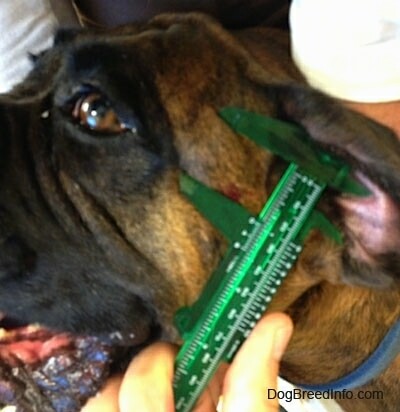 Without his e-collar, he will be able to reach his incision and may scratch or paw at the site. This can result in dehiscence (opening) or infection of the incision and could necessitate a second surgical procedure. Incision Care: Monitor the incision daily for any increase in redness, swelling or discharge and contact us if noted. With most surgery, there is a moderate amount of both swelling and bruising, which is normal; the swelling and bruising typically resolves over several days following surgery. 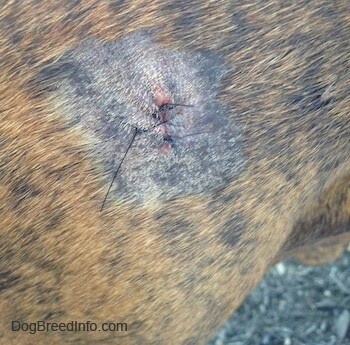 Do not allow Bruno to scratch or paw at the incision for any reason. Warm compresses can be used to help resolve the current swelling and bruising. Use a warm compress 3 to 4 times a day for 10 minutes. A small towel soaked in bath temperature water can be placed in a plastic bag and held over the incision. Continue with the warm compress for the next 3 to 5 days. 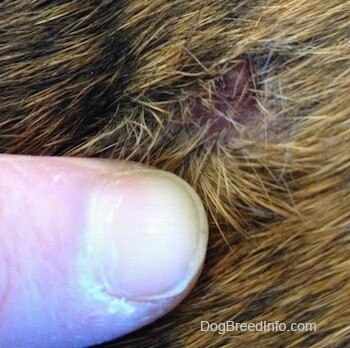 Sutures are typically removed in 12-14 days on recheck exam. Bruno should not be bathed until the sutures are removed. Monitoring: Please continue to monitor Bruno and contact us immediately if you should notice any inappetance, lethargy, vomiting or diarrhea. Since Bruno has undergone anesthesia, it may take him up to 72 hours (3 days) to have his first bowel movement. Do not be alarmed as long as Bruno is eating well and not straining to defecate. Medications: Your pet will need medication. Follow directions on the bottle carefully. Tramadol 50mg tablets: Give 3 tablets by mouth every 8 to 12 hours as needed for pain. This medication is an analgesic and may cause mild sedation. Cephalexin 500mg capsule: Give 2 capsules by mouth every 12 hours for 10 days. Give with food. You may apply a thin layer of triple antibiotic ointment to the wart removal site three times a day. Follow-up: Please call to schedule an appointment for suture/staple removal and re-evaluation in 10-14 days. Bruno was a pleasure to have as a patient! Please do not hesitate to contact us with any questions or concerns that you may have. Good news. Bruno's results came back with very clean margins. That means they tested the edges of the removed tumor and there was no cancer on the outside, which is how we know it did not spread. The cancer itself was very low grade, almost benign. Unlike some other cancers, mast cell tumors are all independent of one another. One tumor is not connected to another. The cancer within the tumor can spread to other parts of the body if it is not removed in time, but each tumor is independent. Every time we remove a tumor Bruno's life is extended that much longer. Not removing the tumor would mean the cancer would spread to his organs and he would not live much longer once that happened. We had to switch to a hard hoody because the soft one didn't stop his leg from scratching his temple. It provided a barrier, but still allowed his leg to scratch his head. 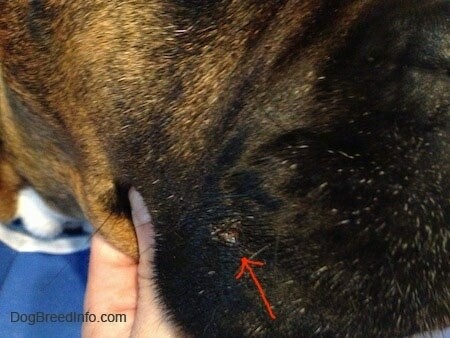 Bruno's suture area formed a pocket of fluid and puffed out. I kept icing it and cut the top off of a pair of nylons and put it over the area for slight pressure. I didn't want it to swell up too much. The vet later said to apply warm compresses rather than cold. This picture is Bruno sleeping inside his hard hoody. That big tongue of his does not always fit in his mouth! 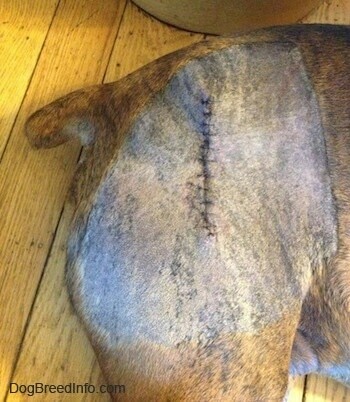 This is Bruno after his sutures were removed. He is very happy to loose the hoody. Or rather I am very happy for him to loose the hoody. He is constantly running into things when he has the hard hoody on. If his head fits he goes for it. He does not think about the size of the hoody and if that fits. Notice how the suture area is still puffed out. He needs warm compresses and it should eventually go back to normal, flat to his head. His eye lid blink has compensated very well. I do not notice any issues with him not being able to blink when he has to. Mast cell tumors can pop up anywhere on the body at any time in various forms. I noticed two spots on Bruno I was unsure about. They were so small that had he not been prone to mast cells I would not have thought much about these areas. The first almost looked like a tick bite. When I spotted it there was a little bit of blood as if it was irritated, but there was also a raise in the skin like a mole. The second was a lump near his elbow on his front right leg. This picture shows me pulling it away from the body. It felt firm and round. I decided it was not something I wanted to chance. I took him in for an early check at his oncologist. The doctor was unable to get a sample with a syringe since the areas were so small so we decided it was best to do a biopsy. They took a small section of skin from each area and marked the spots with sutures so if it is cancer, the surgeon will know exactly where it was. This picture shows the area near his right hip. This is the biopsy area near his right elbow. It was marked with sutures just in case. Once again, Bruno thought the entire experience was a “fun, lick everyone and wiggle the back end” session. The vet said that he was sedated while they took the biopsy and as soon as Bruno started waking up, his nub of a tail started wagging. He was ready to lick someone again. 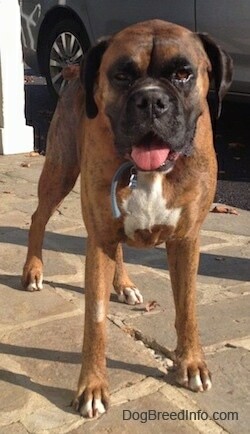 His vet report stated, "Today on physical exam Bruno was very bright, alert and very outgoing." I am not sure I have ever seen a dog so happy to be at a vet's office over and over again. Without the vet and their wonderful staff Bruno would not be here with us today. The results should be back in a few days. 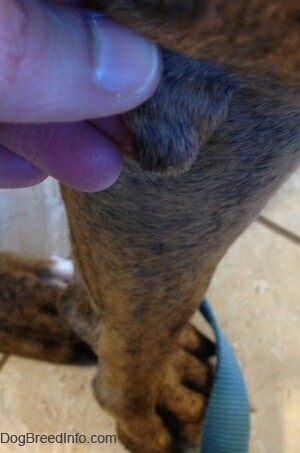 The bump on Bruno's right elbow came back as a sebaceous hamartoma, which is a benign cyst of the hair follicle gland. 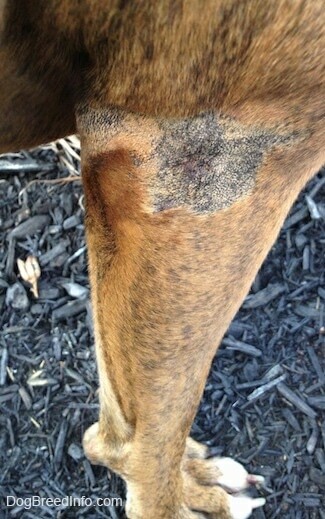 It was cut off for the biopsy and is nothing we need to worry about. The skin lesion on his right hip came back as a low grade mast cell tumor. We are going to have it surgically removed so it does not spread to any other part of his body. The biopsy results came back right before the weekend and Bruno was scheduled to go on a trip to move one of his humans back to Penn State University and then head on up to a cabin in the mountains for the weekend. The doctors all agreed that since the tumor was low grade he could go on his trip and get it taken care of when he got back. 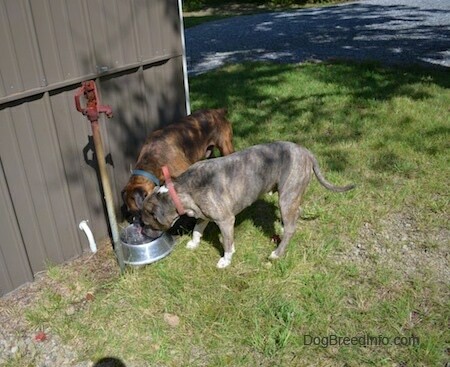 This is Bruno and Spencer on their camping trip in the mountains. Notice how Spencer is smelling the air. He always seems to be sniffing out something. When he hears a storm rolling into the area he always asks to go outside on the porch, where he proceeds to sniff the air. I often wonder what he smells. 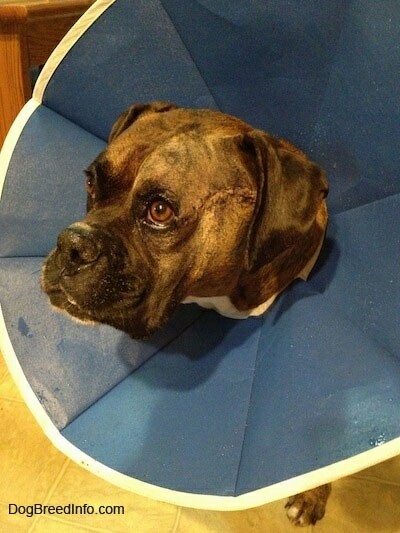 Bruno had his tumor removed. This is him the day after surgery. He's tired but happy. 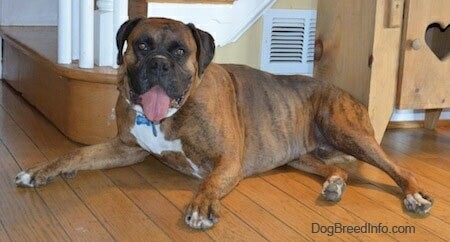 Bruno had extensive blood work and x-rays and all came back normal. The tumor was small, but they took a large area to insure all of the cancer was removed. The biopsy report will indicate the level of aggressiveness. Bruno is trotting around as if nothing has happened. He is on Tramadol for pain and it works very well. He is not allowed to go for walks just yet, although he sure wants to. When Spencer left with Sara for his walk I asked Bruno if he was hungry. Hungry is the word for 'Do you want food?' Bruno immediately forgot about the walk. Yes, he wanted food! He always wants food. I gave him some treats and a bully stick to chew on. In a little over a week he will be back to traveling with his pack. Bruno's biopsy report came back with very good news. It was again labeled as a low grade tumor with clean margins. The grade was so low that they say between the original punch biopsy and the sutures that marked the spot where the cancer was first spotted, all of the cancer cells were destroyed. In other words, the first biopsy actually killed off the cancer. This is very good news as it shows how non-aggressive his cancer is at this point. "At the site of the previous biopsy, the epidermis is hyperplastic, and there is a small serocellular crust on the surface. There is a scar that extends from the dermis into the subcutaneous tissue. No neoplastic cells can be identified in the scar tissue or at the margins." Bruno had a check-up with his oncologist. He got a good report this time. The official report reads. 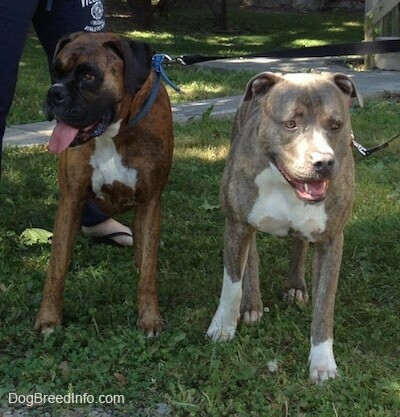 "Bruno appears to be doing well, nothing new was noted on physical exam today. We will continue to recheck him for any regrowth, spreading the appointments farther and farther apart the better and better he does."